Staying competitive in the fast-moving chain drug store world is hard enough in the best of times. But things may be about to get even tougher. Chain drug operators with significant imports, and the corresponding consumer packaged goods partners, now face potentially significant challenges to their profitability in the form of the uncertainty and mixed-signals characterizing the Trump administration’s initial approaches to global trade policy. Look around your store. Imagine what those aisles and shelves would look like if you removed most of the imported general merchandise items. Or, think for a moment what would happen to your annual sales if the wholesale price of seasonal and holiday items increased by 20% or even 40%. In an increasingly hostile trade environment that threatens U.S. importers — particularly retailers and suppliers reticent to embrace any change resulting in a rise in the price of relatively low-ticket and/or impulse goods — the question is not how to avoid risk, but rather how to be better prepared than your competitors to respond to whatever policy scenario finally emerges once the rhetoric and “tweet storm” settles. While anything is possible in the rough and tumble world of international commerce, we believe chain drug operators and their suppliers should consider three plausible trade scenarios: the imposition of a Border Adjustment Tax (BAT); what happens if NAFTA is dismantled; and the possibility of trade conflict with China. The Ryan-Brady plan, a congressional blueprint for corporate tax reform advocating a reduction of the corporate tax rate from today’s 35% to 20%, includes a BAT. If a BAT were enacted, companies would be taxed on revenues generated in the United States less cost of goods sold, provided those goods were not imported, in which case their cost couldn’t be deducted — an effective 20% tax on all imports. Imposing a BAT is potentially destabilizes retailers with thin margins, particularly if the resulting exchange rate moves don’t compensate for the increased costs of imports. During his campaign, then-candidate Trump described NAFTA as “the single worst trade deal ever signed anywhere.” We aren’t sure what a President Trump will do with the treaty, since his initial pronouncements have run the gamut of everything from bilateral reform to tearing it up. As the president sees it, NAFTA gives Mexico tariff-free access to the United States. In 2016 Mexico exported $24 billion worth of food and beverages such as vegetables, fruit and juices to the United States; $28 billion of household durable goods like TVs, refrigerators and cell phones; and $8 billion of household nondurable goods like apparel. We know you may be more worried about Halloween products sourced in China than you are about shrimp and anchovies exported from Mexico, but the fate of the latter may impact the cost of the former. Under the most benign NAFTA scenario, the U.S. and Mexico would agree to modifications primarily in areas like environmental standards on overfishing; needed updates to e-commerce and digital trade; and rules-of-origin regulations that are important to the auto industry. While certain labor standards updates may raise costs, specifically in areas like apparel, these reforms wouldn’t cripple U.S. retailers. In a disruptive NAFTA scenario, American and Mexican negotiators would be unable to agree to a deal. The U.S. Congress must ratify any changes to NAFTA. But President Trump can terminate it with a stroke of his pen, driving tariffs back to pre-1994 levels. China, likely of more direct concern to chain drug operators than Mexico, is the other target of the Trump administration’s ire. The most extreme Chinese trade policy proposal involves imposing a 45% across-the-board tariff. This would profoundly impact chain drug store retailers, specifically in the general merchandise and soft goods macro-categories. Chinese exports account for 20% of U.S. household spending on furniture and household goods categories; for clothing and shoes the rate reaches 36%. The math is simple. Retailers would have to either absorb massive increases, killing their margins in the process, or pass those increases on to consumers. China would then retaliate, likely by countertariffs on American exports. Things could get even worse. Lotte, a South Korean department store operator, was forced to close its Chinese outlets over China’s unhappiness with American missile deployments in South Korea. Any retailer operating in China — and perhaps any U.S. manufacturer — might face similar retaliation if a full-scale trade war were to break out. There’s no question that — depending on their class of trade — retailers face different risks under any trade war scenario. But what unites them all is the need to understand their risk exposure to trade disruption better than their competitors do, and an imperative to develop a more agile approach to addressing those risks. As an old cliché tells us, a gazelle doesn’t have to be faster than a lion, it just needs to be faster than the other gazelles the lion is chasing. When it comes to a changing trade policy environment, chain drug retailers and their suppliers have a number of responses available to them. Each response requires detailed thought and analysis. Absorbing costs isn’t ever a palatable idea, but there may be no alternative if consumers are unwilling to pay 20% to 45% more for Easter baskets or Holiday snow globes. Every chain drug store operator must determine cost impacts to their individual bottom line under a variety of scenarios; analyze price elasticity in their categories; think through competitive response; and factor in currency implications. For their part, consumer products executives need to examine their supply chains and assess alternative sources of supply — especially reshoring to the U.S. This requires an understanding of the required investments, cost differences between countries and technological and demand capacity. What, for example, happens to prices if large demand volume moves to a new set of suppliers in a short time frame? There are also longer-term issues such as whether suppliers believe new trade policies are just short-term negotiation tactics or a significant, and more permanent, shift back to a more protectionist age. The immediate and long-term health of the chain drug industry — and the fortunes of many of the companies that supply it — are dependent on which scenario finally emerges and how well they are positioned to react when it does. Future success can’t be ensured, but wargaming potential responses can help drug chains and their suppliers to test-drive different strategic responses to change and get ahead of the ­competition. Todd Huseby leads the Consumer Healthcare sector at A.T. Kearney, a global strategy and management consulting firm. Jim Singer is a partner in the firm’s Retail and Consumer practice, and he co-heads the firm’s Trade Wargaming initiative. 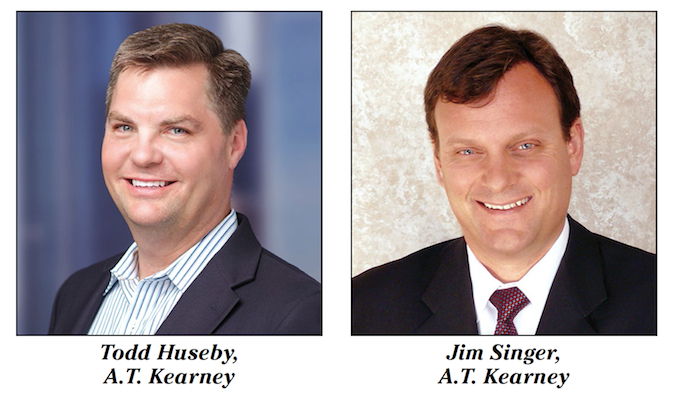 They can be reached at Todd.Huseby@atkearney.com and Jim.Singer@atkearney.com, respectively.